Killer Characters: Once a Parent . . .
Once a Parent . . . If you're a parent, I don't think it matters how old your children are. You're still going to worry. My son, Sean, and my daughter, Laura, are both successful, professional adults, but that doesn't mean I'm not concerned for their well-being. Sean and I have had some problems with our relationship recently, but things are much better now. Laura and I have always gotten along well, because she is probably more like me, while Sean is more like his late mother, temperamentally. I'm fairly easy-going, and so is Laura. She, however, loves to be in the spotlight, while I'd rather lurk backstage. That is why she became an actor and went off to Hollywood to seek fame and fortune. She's not a major star yet, but she's had some success. That's why I was surprised -- albeit very pleased -- when I discovered that Laura was going to spend the fall in Athena with her brother and me. Teaching acting, of all things, at Athena College. It will be wonderful to have her here, and I know Diesel is delighted because he adores my daughter. 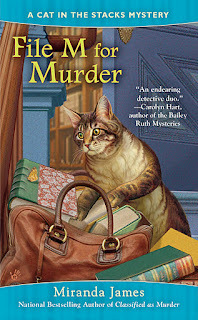 File M for Murder goes on sale officially on January 31st, both in print and electronically. Charlie, why does Diesel look so sad on the cover of File M for Murder? And is he packing or unpacking? Janet, I think Diesel is searching for something to nibble on. He's always hungry. And that look on his face means he's contemplating what he might have next to eat. I agree Charlie, our children are always our 'babies' and we worry about them all the time. Forget this adult stuff. Hope things go well for Laura. The new cover is soooo cute!